Cognitive Coaching & Cognitive Behavioural Therapy are both 'present' focused so they concentrate and explore how you are now - your thoughts, feelings and behaviour of today. Both help you move forward by addressing current concerns and teaching you specific knowledge and skills to make every day more positive. for young people individually or for parent/carers who have a child with autism (mid to high functioning), anxiety, ADHD or other concerns. Cognitive Coaching enhances your knowledge and skills by combining key elements of Cognitive Behavioural Therapy and Coaching to improve family life. for individuals who wish to address concerns such as insomnia, mild to moderate depression, phobias, anxiety, self-esteem or to improve general wellbeing. Your thoughts about an event or situation affect your feelings and how you act rather than the event itself. 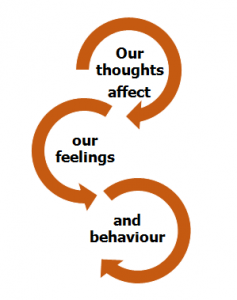 CBT works by challenging negative thought patterns and replacing them with more positive, adaptive thoughts.